I planned for my Etsy shop to launch nearing the holiday season from December 11-17, 2016. I've worked with handlettering and papercraft as hobbies and always enjoyed making my own cards for friends. Opening an Etsy shop began as a suggestion and became a frequent thought as more people opened me up to the idea. It is from their reassuring vibes and precious support that it finally became a reality. More than anything, I'd like for my brand écrivons! and my stationery designs to encourage people to revisit handwritten connection (follow the link to the shop to learn more). What better way to start than during a time when people think to write and send Christmas cards anyway! But I hope to challenge people to do so all year. The cards were printed on French Paper Co. cardstock: 100lb Standard White Kraft, 100lb Brown Bag Kraft, 110lb Smart White. French Paper Co. is located in Niles, Michigan and has a 100% hydroelectrically-powered paper mill; they use post-consumer waste/recycled materials for their papers. I love love love their paper! This card turned out to be the most popular buy, and I had to restock it midweek. Funny story: I initially wasn't planning on selling this design, because I thought it was too plain. However, I realized that none of the other designs I had made for sale included the actual phrase "Merry Christmas," and what kind of Christmas card sale wouldn't have cards with that on them? So that was the only basis on which I decided to include this design in the official holiday launch. Needless to say, I was pleasantly surprised, and when I saw how much love this simple design received, it began to look more pretty than plain. The second most popular buy (and my personal favorite design) were these "Happy Holidays" cards that I made to order. I did not end up restocking these when they sold out midweek though, because they required a few more steps than the others and production time came to be a bit much. I handlettered the words with nib + gouache and then rendered it for print on Photoshop; they were printed on French Paper Co.'s beautiful 100lb Standard White Kraft paper. There were two options for the main design: (1) the red/silver Santa hat and (2) the green/gold Christmas tree. These were hand-cut from foil paper and foil tape; I also hand-embossed the foil paper using my scoring board. My favorite media to work with is simple brush + black ink for illustration and lettering. These designs utilized this concept but with added watercolor for a bright pop! against pure white (you'll see further down that the brown kraft paper card designs stopped at brush + black ink). The "Happy Holidays & Poinsettia" design was sold as an individual card, while the other brush lettering and watercolor designs were made available as a set of four "Religious Greetings" cards. ...these were a few of my favorite things! Well, designs. This set of four I dubbed "Wintry Greetings": season's greetings, good tidings of comfort and joy, merry & bright, and warm wishes. These were indeed my favorite designs to create, and I love the rustic feel that brown kraft paper gives off. As I mentioned earlier, my favorite medium of illustration and lettering is simple brush + black ink; for these designs, I left it at that and opted not to add more color. 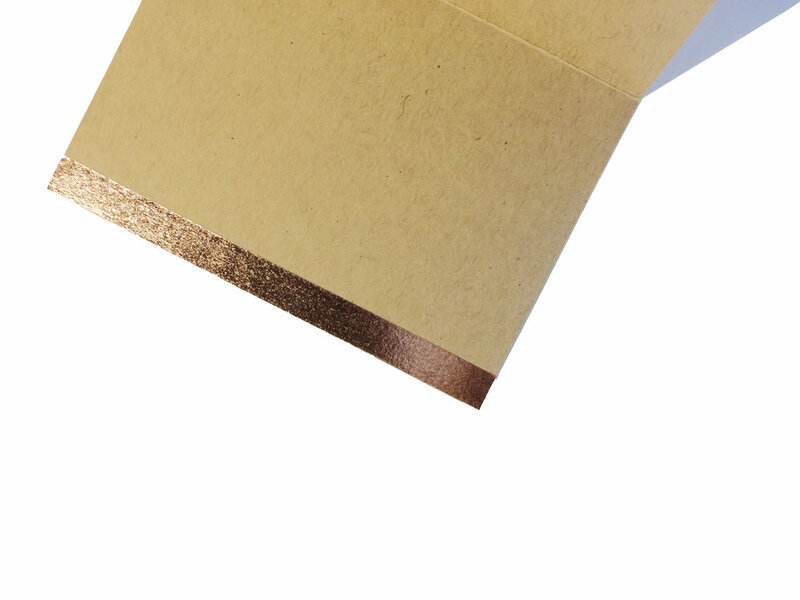 All cards featured a silver, gold, or rose gold foil lining on one of the inside flaps. This lining peeked out from behind the front cover of the card when closed. Another funny story: these "luxe trims" came to be due to a not-so-luxe printing error. When I went to score and fold my first batch of prints, somehow the fold was just very slightly off, giving the cards a small underbite. I confess: I freaked out a little...and perhaps even shed a couple tears of frustration. But my siblings helped brainstorm solutions--after calming me down, of course--and with the foil tape I had on hand for the Santa hat/Christmas tree cards, we literally found the silver linings in the mishap. In hindsight, I'm actually quite thankful this happened, because I felt that it added a unique, merry and bright touch to my cards! Creativity is key. In short, I felt that I had a very successful launch week. I sold out of my starting inventory, orders came in steadily, fulfilling/shipping them kept me busy all week, and I even received custom requests after! If that's not a good launch week, I don't know what is. Part of me wonders whether it was the timing: people are already looking for greeting cards this time of year especially. Oh, and most of my customers were my friends or acquaintances. Also, I did not break even financially, so I guess "success" measured by revenue is debatable. However, I had braced myself for that going into it, knowing that launch costs were deep and achieving the break-even point might occur beyond the launch. So I'm calling it a success, and I'm not in it for the money anyway. I learned so much and was greatly challenged. One of my biggest takeaways from this is probably that there are some things you just have to try first and adjust accordingly as you go. Baby birds learn how to fly by being thrown out of the nest and thrust into the air. That's how I felt throughout most of the launch, thinking to myself, What the heck am I doing? or I don't know what I'm doing! But this experience helped me build a confidence out of the things that get me most: fear of failure and uncertainty. These have been the primary insecurities plaguing my gap year and my faith. They are not new struggles and will continue to be as long as I am human. But as cheesy as it sounds, I think this launch week helped equip me a little better for those battles. I was reminded to believe in myself, in the talents God instilled in me, and in the love He's placed around me. Dreams are worth the risk. Let's see where this goes, écrivons!